The Cozy Posy HugglePod HangOut by HearthSong is a hybrid between a children’s play tent and a children’s hammock chair. This big hanging pod chair for kids is suitable for indoor and outdoor use, and it includes three windows, plus a fabric door. 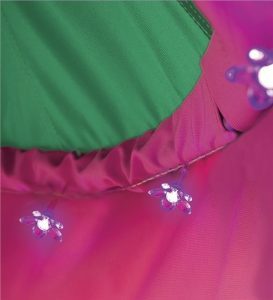 It also features a Velcro outside pocket for leaving messages or treats, and an interior ceiling wreathed with beautiful LED flower lights. This hanging pod chair has a height of 48 inches and a width of 44 inches and can hold up to 225 pounds. The crescent stand measures 94 inches in height with a base measuring fifty inches in diameter. 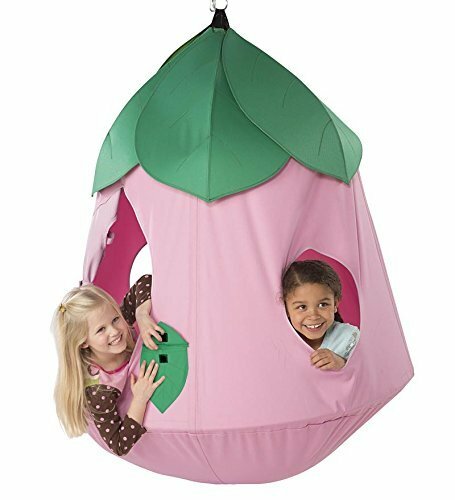 The Cozy Posy HugglePod HangOut is bound to capture any child’s imagination. It is beautiful, well-crafted, and big enough to safely hold several small children at play. The structure is far more sturdy than it looks, thanks to the crescent steel stand, which holds up to 225 pounds without any strain. The windows and the fabric door look delicate and fairy-like, but they are relatively resilient, and will easily withstand the stresses of child’s play and outdoor use. The fabric is easy to clean with soap and a wet wash cloth. It is marketed for children aged preschool or kindergarten, but can accommodate children who are a little bit older (10 or 11) as well. The floor of the pod is soft, supportive, and comfortable enough that many younger children will gladly crawl inside for their daily nap. 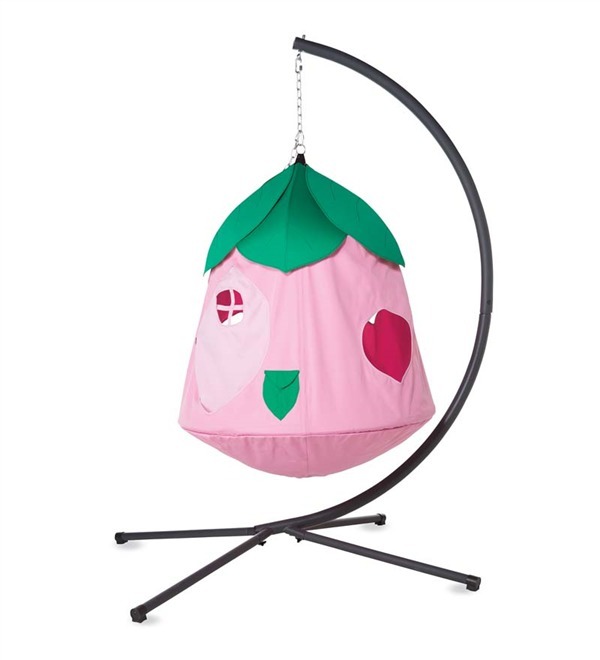 The biggest pro of this HearthSong product is its creativity, uniqueness, and vibrancy: the Cozy Posy HugglePod HangOut goes far beyond the standard hanging chair design, and it will keep children entertained for hours on end. 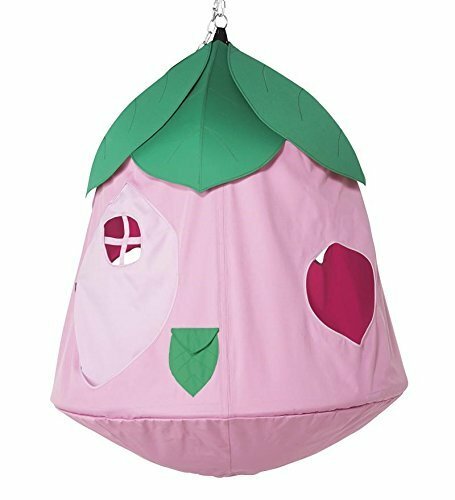 The windows, the fabric door, and the LED flower wreathing inside give this big hanging pod chair for kids a personalized clubhouse feel, which will spark their imagination and encourage cooperative play. Despite its delicate appearance, it is also sturdy enough to hold up under the stress of several kids climbing in and out often. Everything is included with the HugglePod, so the only thing that buyers need to provide is adequate space to hang it. For those who want to hang it from a tree limb, HearthSong sells high-quality tree hangers that can be purchased separately. The biggest con is the amount of space that the product requires. The HugglePod is designed to provide adequate playing room for several children, and as a consequence, it requires a fair amount of free space. This can make it difficult for indoor use in smaller houses or homes with low ceilings. This hanging tent chair for children is an excellent product for parents looking for a hanging pod chair that doubles as a playhouse. It is sturdy, beautiful, and big enough to hold multiple children at once. This product is recommended for anyone who can find the space to hang it. A comparable, though less playful product is the Hanging Nest JOKI by La Siesta (our review) , which can be hung from any tree limb, swing set, or ceiling, and supports up to 175 pounds.